“THE young inventor looking for new worlds to conquer would do well to investigate the vast but little-explored domains of electrochemistry. Hundreds of new products and inventions difficult or impossible to discover during the countless ages of the past with mechanical skill alone are today readily possible through the combined power of electricity and chemistry Thus Professor Colin G. Fink of Columbia University presents an invitation — and a challenge—to inventive minds everywhere. He sees no reason why young men with courage and imagination should not play an important part in future scientific development and he believes his own field offers unlimited possibilities for advancement. 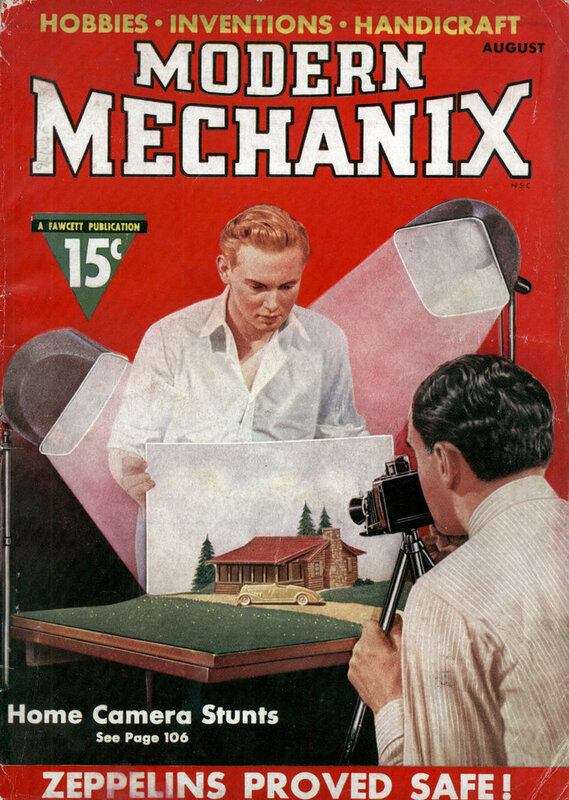 When I called on him in his laboratory at Columbia, I told him the readers of Modern Mechanix were particularly interested in needed inventions and I asked him to name a few of the problems which, in his opinion, demanded the greatest attention at this time. “Our basic engineering metal is iron,” he began. “It is the most abundant and has the most valuable properties, such as high tensile strength, high fatigue value, etc. The world produces more of iron and steel than all the other metals put together. For every 100 tons of iron and steel, only 2 tons of copper are produced—and copper occupies second place in quantity and importance among metals! “With ever rapidly increasing utilization of steel in railroads, automobiles, bridges, buildings, high transmission towers and other articles, the problem of eliminating rust and protecting steel products and costly structures against corrosion is undoubtedly the biggest problem confronting the chemist and engineer. Metals rust as a result of electrochemical action. If we eliminate this, we eliminate rust! The young men of the coming generation will solve this problem; marked progress towards a solution already has been made. “We are also badly in need of an electric source of illumination suitable to our eyes which will operate at 90 per cent or better in efficiency instead of less than 10 per cent as at present. Electricity is modern man’s indispensable and versatile servant; eliminate it and civilization would drop back 100 years, But, although electricity has increased the efficiency of old hand-operated machines and innumerable devices a thousandfold or more, it has so far not accomplished anything near as much for artificial light. “The tungsten lamp in the average man’s home furnishes but 5 cents’ worth of light for every dollar’s worth of electricity. The balance, 95 cents, is lost as useless heat. Modern homes and towns need a lamp that will furnish at least 90 per cent light and only 10 per cent heat. The little firefly, or glowworm, operates its light at figures even better than 90 per cent. The lamp of the future may very well be based on principles similar to those of the firefly’s glow. “A simple means of electrically controlling rainfall—keeping it out of the cities—is another important problem to solve. The Cottrell electrical precipitation process is used at factories all over the world to precipitate fumes, dusts, smoke and vapors of all kinds. It requires very little development to apply this same process to the precipitation of rain in localities outside of towns and cities. Millions of dollars’ worth of shoes, clothing and other goods are annually destroyed in the cities on account of rain. “We should systematically investigate the application of electric currents in the stimulation of the growth of living cells and the formation of many organic compounds. The production of fruits, vegetables and other food materials in a few localities and then shipping them half way around the globe appears to us an awful economic waste and extravagance. With the aid of electricity, truck farms located in the outskirts of cities, or on the roofs of skyscrapers, will produce any, or all, fruits and vegetables. Why not? Dr. Fink is, himself, working on two important developments at the present time. He is experimenting on a way to convert the sun’s rays into electric power and he is trying to find a satisfactory method of extracting gold from the seas. In explaining his “power from the sun” theory, he told me that mankind was rapidly approaching the need for additional power resources. Dr. Fink’s new photo-electric generator cell produces about 25 per cent more current than devices formerly used and also is more sensitive to light. The current obtained is still far too small to be practical for commercial power generation but he expects a vast improvement will be made in the near future. Pointing out that this cell is not the “electric eye” of the motion picture and television, he said it was composed of a sheet of metal in a salt solution or in contact with a salt which, like silver bromide, is sensitive to the sun’s rays. Opposite to this sheet of metal, but kept in the dark, is a second sheet of metal. While the sun shines on the first an electric current flows from one sheet of metal to the other. “It has been known for a long time,” he explained, “that some chemical compounds are changed in composition upon exposure to the sun. Now certain of these compounds change in one direction only. Thus white silver bromide is converted to a black product when exposed to the sun, as all amateur photographers know. Another well known case, especially for the Sunday hiker, is the way green pop bottles will be found to have changed to a lavender shade after having been discarded and left to lie on the ground exposed to the sun’s rays. The “gold from the sea” problem is one that has baffled scientists for many years. One of the main difficulties in this field has been the fact that the gold particles, or ions, that carry a positive charge of electricity, are unable to get close enough to be deposited on the negative electrode, or cathode, because the alkaline film surrounding the cathode is too thick. This alkaline film is brought about by the decomposition of sodium chloride (ordinary table salt) at the cathode, the sodium ions being converted to sodium hydroxide (lye). Dr. Fink has succeeded in overcoming this film obstacle by rotating the cathode at high speed, an action that reduces the thickness of the alkaline film. He uses a copper disk for his cathode, which is electrically propelled and spins around at a terrific speed. It is interesting to know that his original apparatus was the familiar malted milk stirrer. He took off the little nut at the end of the rod and replaced it with a copper disk the size of a half dollar. But the speed of the malted milk machine was not high enough and he substituted his present apparatus which, while considerably larger and heavier, looks not unlike its smaller counterpart in any drugstore! In a typical experiment, Dr. Fink employed a disk of 5-centimeter diameter, spinning at the rate of 8,500 revolutions per minute. The disk was set in three liters of a 3 per cent salt solution containing three miligrams of gold. At the end of a half hour, more than 90 per cent of the gold was plated out on the disk. 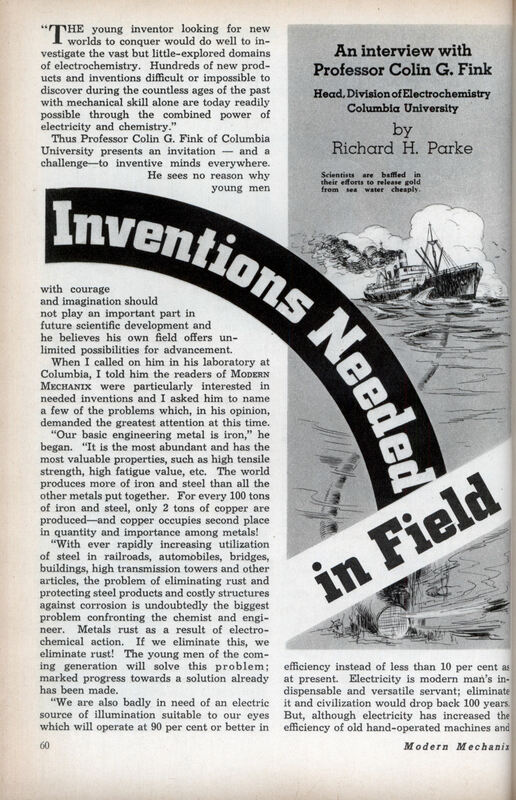 Dr. Fink pointed out, however, that hope of recovering billions from the seas must be dispelled for the present because the cost of the electricity to operate the cathode is about five times the value of the gold recovered. He added that at the same time this procedure was more profitable in the case of radioactive metals. The metal polonium, for example, can readily and profitably be recovered from waste solutions. We do have fluorescent light bulbs these days. But given that there is 250 times as much uranium in seawater as gold, I’m surprised that we aren’t using the Fink rotating electrode process now to obtain it! … and we have stainless steel, too. However, Light Emitting Diodes are even more efficient than fluorescent tubes. John: And cfb:s only have 10% luminous efficiency, tubes have ~20%, so there’s still a long way to go. Then again, incandescent bulb only have ~2% le. Most likely Uranium isn’t extracted from the seawater, because the process costs more than the price of uranium. KH: I was under the impression, that so far better efficiencies were achieved only in laboratory and cold temperatures?